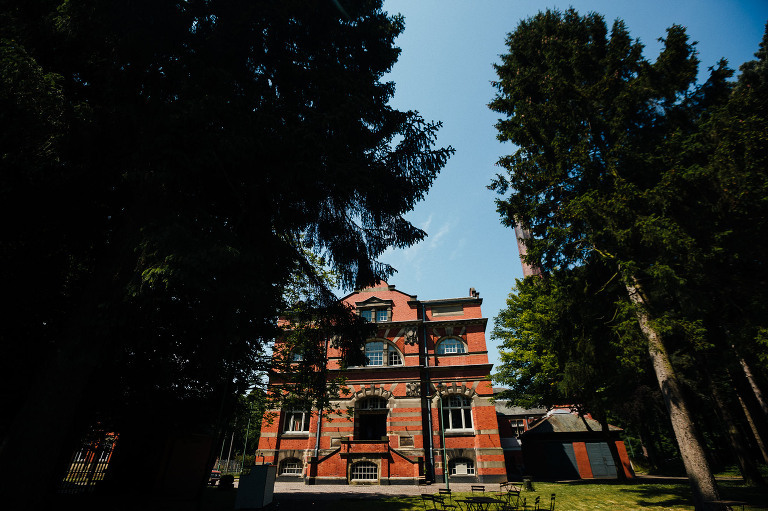 Sammy and Chris got married last May and I was delighted that they chose me to do their photography at The Pumping House Ollerton. It was my first wedding at this gorgeous exclusive wedding venue and what a delight it was. Not only was it a cracking venue to shoot at with lots of interesting features to photograph against. But I also had the best couple to shoot here. Sammy and Chris are super lovely and fun and cool, and I thoroughly enjoyed photographing their wedding at The Pumping House in Ollerton. I knew they would be fun to work with after their gorgeous engagement shoot at Burnt stump and I was not wrong. 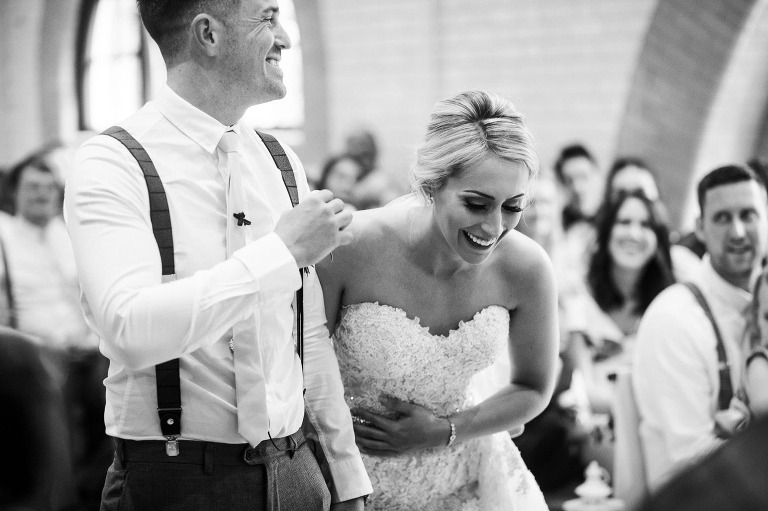 I asked Sammy and Chris to select their favourite five images from their wedding photography at The Pumping House Ollerton, and give me the reasons why they chose their selection. Here are their choices and stories behind them. I love this photo, most probably one of my favourites! 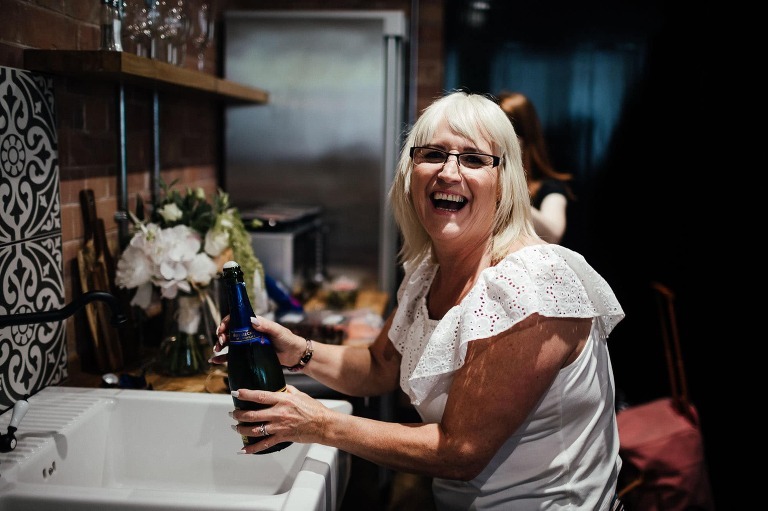 moments after popping a bottle open with a bang, the smile says it all! This photos gives me butterflies every time I see it. Kathryn captured our wedding venue in the most perfect way. This photo helps us relive the best day of our lives. This photo sums up our day! It captures the constant giggles we had from the onset. The giggles just kept on coming that’s for sure! The best surprise ever! Chris organised for Ava to come and be part of our day, and by the happiness on our faces you can it was the best decision. Our day wouldn’t have been the same without our fur baby. My closest friends and family all together for me, helping the day become that even bit more special. Some were meeting for the first time but it felt like everyone had known each all their lives and they contributed to the best day of my life. Video fusion! Photos are fab, but seeing your wedding in motion is amazing!!! Honestly, we wouldn’t change a thing about our day – BEST DAY EVER! Believe it or not We found Kathryn while searcher for a videographer!! We fell in love with the way she shoots her video fusions and the style of photos she takes… You were absolutely fantastic, and completed our day. We’re chuffed with the photos you’ve taken!! Well thanks guys for your lovely comments. Its really interesting to see your faves. Here are my top 36. Always tricky to chose just a roll of film to showcase such a fab day. But these represent some of my picks from the day. If you want to see more, there is a slide show and video fusion at the bottom of the post. 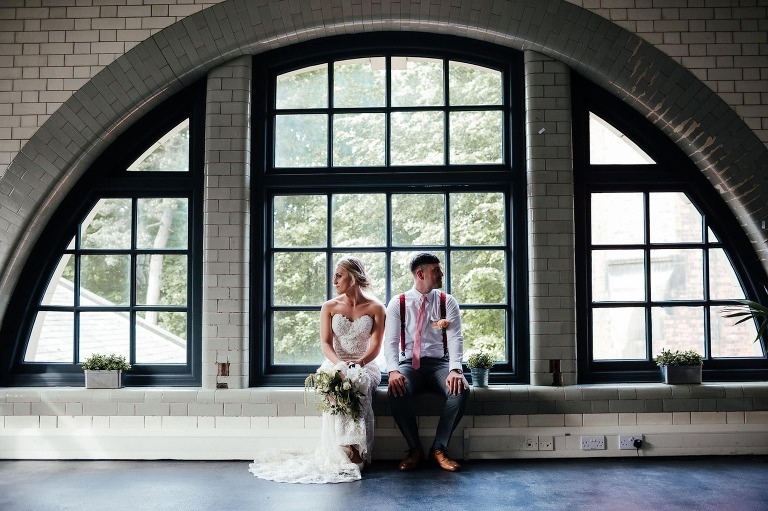 My highlights from the photography at The Pumping House Ollerton include the bridal portraits of Sammy in that gorgeous window light. The super cool shot of the two of them in front of that amazing window. A nice reflection in the round mirrors. And the dancing and fun at the end of the night, which was amazing. There were loads of great shots of Chris with his lads having cigars outside at the end of the day and they were so much fun. I just picked one, but you can see more in the slide show. What great fun everyone was!